The Allies signed an armistice with the Germans on November 11, 1918. The Students’ Army Training Corps had been in existence for little over a month, and there was question as to what would happen to the organization now that the war had ended. At first the University had reason to believe that the S.A.T.C. would remain in existence, despite the armistice. Washington immediately sent a telegram to the administrators of the University stating that the S.A.T.C. would definitely be continued. In addition, the War Department had a one-year contract with the colleges participating in the S.A.T.C., and few believed it would break this contract early. But, by late November, the Government ordered that all units of the Students’ Army Training Corps be demobilized. This decision came as a surprise, and caused the Penn community to question what the role of military training and instruction would be in the post-war period. The Provost and the Board of Trustees felt that military training had become a valuable part of Penn education, and were quick to take action in preserving it. At the meeting of the Board on December 9, 1918, the first meeting after the demobilization, the Provost proposed the re-establishment of the Reserve Officers’ Training Corps, which had existed at the University before the Students’ Army Training Corps was created. The Board granted Provost Smith the authority to re-establish the R.O.T.C., and also to develop a naval training unit if the conditions at the University permitted. In addition, the University allowed the Department of Military Science and Tactics to resume work under Major Griffith once the demobilization process was complete. In April of 1919, Provost Smith received word from the Government that Colonel Sheldon W. Anding was to be a new Professor of Military Science and Tactics. Now that the war was over, however, some University professors believed that the continuation of military training would only detract from the renewed focus on academics. In correspondence with other universities, Professor Robert H. Fernald of the Towne Scientific School discussed the fate of the S.A.T.C. before demobilization, but after the armistice was signed. A professor of the engineering program at the Massachusetts Institute of Technology expressed to Professor Fernald that the rigid schedule of military training was not allowing students enough time to study. The Dean of Engineering at Purdue University, C. H. Benjamin wrote to Fernald that discontinuing the Students’ Army Training Corps would allow the colleges to return to normal schedules and get students back on track to graduate on time. Both inquired as to the views of Professor Fernald on the matter. In a response to Benjamin, Professor Fernald stated that the general sentiment at the University of Pennsylvania seemed also to be that military training at the school had negative consequences. Because the Students’ Army Training Corps had overshadowed all other University activities, students were excited by the return to normalcy after the order to demobilize the S.A.T.C. on all campuses. The Red and Blue issue published in February of 1919 was designated the Resurrection Number, in honor of the resurrection of regular student activities and studies. Not only would fraternity life, student publications, and other activities “rise again,” but also students would be able to study harder without the limitations on scholastic work imposed by the Students’ Army Training Corps. The Pennsylvania Gazette, formerly known as Old Penn and still published under the authority of the Board of Trustees,echoed the Board and the Provost’s opinion that demobilization was not a removal of limitations on University life, but a removal of the benefits provided by military training. Convinced that military training had great positive effects on the discipline and physical fitness of students at the University, The Pennsylvania Gazette wrote that if military training should be deemed unnecessary because of the armistice, the University should find some substitute that would provide the same benefits. Proponents of this suggestion got their wish with the continuation of the Department of Military Science and Tactics through the school year and the reestablishment of the R.O.T.C. In the decade after the armistice was signed, the Reserve Officers’ Training Corps became a staple at the University. The four-year course in military training for members of the R.O.T.C. began again in 1919, and saw its first peacetime graduates in June of 1922. In that year, a total of only nine students received commissions at graduation. The number of commissions awarded at the University gradually increased each year, until it skyrocketed to 108 commissions awarded in 1926. Of course, this was not equivalent to the level of involvement during wartime, but, nonetheless, it signified a significant growth in students’ interests in the R.O.T.C during peacetime. After graduating a high of 112 students in 1927, the R.O.T.C’s commission total dipped, and remained between 75 and 100 for the years 1928 to 1932. Still, ten years after the first peacetime R.O.T.C. graduating class, enrollments in the program had significantly increased. It was safe to say that the R.O.T.C. was well-established at the University. Those in favor of military training had won a great victory, and they succeeded in creating a permanent military fixture at Penn. As we have pointed out before, the terms of the coming peace conference will largely shape our military policy. If the conference can convince the world that it has eliminated the likelihood of future wars, or if it provides for universal disarmament the necessity for military training per se will disappear. To be sure it is the hope of some idealists that the peace conference will remove the cause of all wars, but the great lesson this country has learned from the war is the need for preparation. Several people felt that an emergency could spring up again at any time, and that it was important for protecting the nation to remain militarily prepared, even during peacetime. A nation possessing [the supernational mind] has come to understand that its own well-being and prosperity are not marked off from that of its fellows, but are part and parcel of the well-being of all. Such a nation has learned that there is a political and economic relation higher than even a sovereign state. Finally, for the development and growth of the supernational mind we shall need the most intimate and numerous contacts, not only between governments, but between peoples. This can come only from an international commerce such as we have never known before. A commerce of things and thoughts, and ideals. In this way, military preparedness would become unnecessary. As The Pennsylvania Gazette demonstrated, several people disagreed with McClellan’s ideas. The University authorities’ conservative approach to military preparedness was reflected in their choice for the 1919 Commencement speaker, General Wood of the United States Army. In his Commencement speech, General Wood criticized the League of Nations, stating that national interests should be the country’s top priority, and that a strong national spirit would allow the country to be a real power with the ability to engage in international charity. In addition, he argued in favor of continued military preparation: “We must remember that arbitration will be far more successful if we are not only right but also have strength.” While the 1919 Commencement occurred many months into peacetime, it still had a decidedly military feel to it, with many graduates dressed in uniform and a memorial dedicated to those who fell in the war. Ultimately, however, the wartime drive and sense of urgency that had propelled the University into an intense commitment to military training could not be maintained in peacetime. A return to the normal routine of the University appealed to many students and faculty members, and the emphasis on military training and instruction gradually diminished. The University, however, was still able to show its great respect for the military through actions such as honoring General John J. Pershing, Commander-in-Chief of the American Expeditionary Forces, and General Sir William Arthur Currie, commander of the Canadian Expeditionary Forces, with honorary degrees in February of 1922. In addition, the Provost and the Board of Trustees kept the notion of military preparedness alive on the campus with the re-establishment of the R.O.T.C., which grew in the post-war years, and which still exists at the University today. a loss in their student registration due to the war, and it was felt that this loss, which also extended to other departments and produced a material decrease in tuition fees, was in itself a condition which the Trustees would be called upon to face. In this connection the Provost spoke of other problems confronting us, for instance, the question of retaining or not next year a number of instructors, and the further question as to the advisability of promoting assistant professors at this critical time in the history of the University. After the war ended, it was imperative that the University capitalize on the opportunity to make up for wartime losses in tuition, so that it could comfortably retain its staff, promote deserving staff members, and continue managing its property. To meet the many grave problems that will come up daily in the reconstruction days that lie immediately before us the world will have the greatest need for college trained men. Indeed, there never was a greater premium placed on a college education than today. The war itself has emphasized this, and many a young man who has taken from the class room to the training camp and battlefield today has a keener understanding of this fact than ever before. On October 13, 1919, the Committee on Finance and Property reported that 9,333 students were enrolled in the University, making 1919-1920 the year with the largest enrollment total in the history of the University. Provost Smith and the University authorities achieved their goals with this quick resurgence in registration. The students, however, were more concerned with regaining the prewar academic and social atmosphere at the University, and were excited to welcome their peers back from war for that reason. With demobilization complete and soldiers returning to campus, students had more time to focus on their studies and more participants who could help revive extracurricular activities. 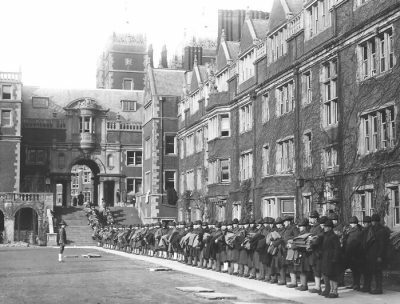 Furthermore, they were ready to move forward into a new era at the University of Pennsylvania, to separate themselves from the war legacy, and to make their own mark in Penn’s storied history. 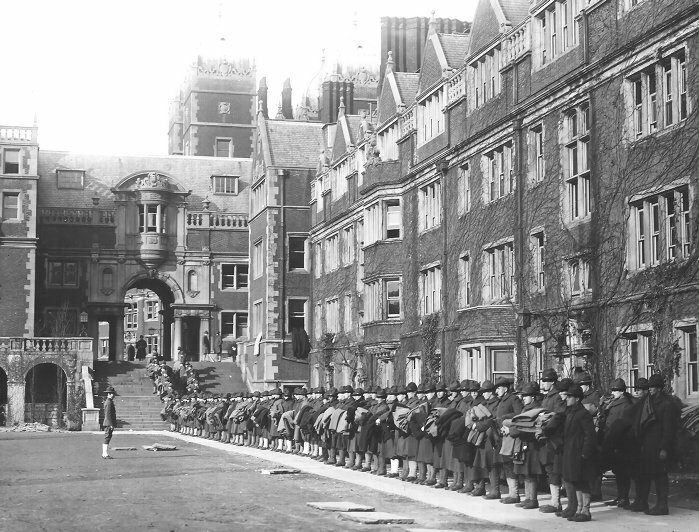 Still, no member of the Penn community could accept the return of former soldiers without remembering those who were not able to return; both the University and its students honored those men who lost their lives fighting in the war. Penn’s graduating class of 1919 honored their fallen classmates by naming all of them class honor men, positions that were traditionally filled by four elected seniors. At Commencement in 1919, the University conferred degrees upon the members of the class of 1919 who had died in the service of their country. These actions demonstrated the intense respect that members of the University felt for those who had participated in the war effort. Above all else, the University was fervently patriotic and loyal to the United States war effort throughout the Great War, and even after it, while memories of the war were still fresh. This patriotism was perhaps the University’s greatest wartime legacy.